Every parent wants to see his child on the highest latitudes of success and to achieve that desire, a parent explores out his capacity on every vertex. No doubt, parents continually try to extract out a portion from their regular income in order to save them for future use. But, the high requirement of money on higher studies nullifies the value of saved money. Rather, the requirement of higher studies, in good schools/colleges or degree from international institutions calls for the higher cost of money. The bank savings merely do not hold that capability to fulfill those expenses and thus parents feel helpless. So, what should these parents do? What can be the best ways to save the money and convert it into large money? The answer is the Mutual Funds. This article is dedicated to Indian parents who struggle a lot to make their child’s future bright. This article will tell you some child-focused mutual funds which will help you to grow money for them for their future needs. After all, the more early you invest, the earlier you are able to grow the money in large amount. 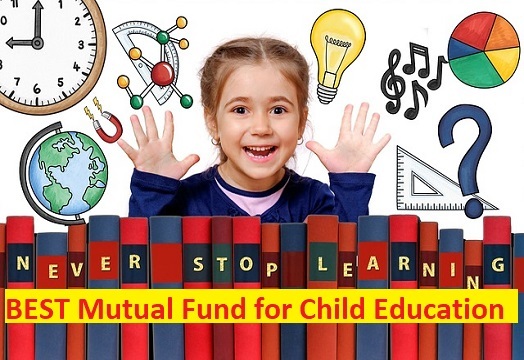 How to fund Child Education using Mutual Fund? In this post, I am going to communicate the information about the best mutual fund for child education. Which is the best mutual fund for child education 2019 must be the lookout for the investors who are keen on investing for children education? Stay tuned with the post to fetch details for a best mutual fund for child education. You have heard about SIP (Systematic Investment Plan). You can take advantage of it by regularly investing the money in your SIP plan for some small amount. In this way, you will be able to accumulate wealth without any financial pressure and you will simultaneously gain superior returns. You can diversify your funds at different sectors and that too via SIP plan. In this way, you can enjoy the superior returns from every sector. This methodology will help you to cope up with the losses in one sector by the returns from another sector as you have not invested your whole money in one place. Instead, you have diversified the same which is providing you such advantage. Also, you should invest in midcap and balanced funds. Below table will help you to get the names of some top class child based mutual funds. You can analyze this table in terms of returns, performance, and rank of funds. As you are planning for your child having age group between 11-15 years, so you need to plan the important first ladder of his career after 10th standard. You should invest the money in SIP, with a small amount like Rs5000 every month until 5 years. As you may need much money for your child’s education needs like his current school fees, coaching fee, or accommodation fee. So it will be better to diversify your investment rather than investing the whole amount altogether in equity funds. To diversify your funds, 1 large cap, 1 multi-cap, and 3 balanced funds will set the best portfolio for you. You can continue to invest the money till 5 years. You can invest in the above funds via SIP also. Your investment until 5 years of Rs5000 will become 3 lakh, thereby growing your investment value to Rs5.1Lakh in 5 years. Now, your child has crossed the age of 16, so it the time for pouring your money into his higher education needs. To get such high money on time, you can invest in short-term debt funds, whose maturity lies in between 6 to 12 months. You should diversify your funds also in various sectors to complete the needs to coming higher education of the child, maybe in international colleges or whatever. So you can invest you 30% capital in equity in large-cap and rest in debt funds. In this way, you can earn regular money from debt funds and superior returns from equity for a major purpose. How we Earn Money From Share Market? Aditya Birla Sun Life Equity Fund is a diversified category fund and the Crisil has it on position 2. It has provided a return at the rate of 29.5% in one year and in the last five years, it is 22.4%. Currently, it is managing AUM of Rs 5,529.93 Crores. You can start to invest in this scheme from Rs 5000. The fund will attract an exit load of 1 percent if the fund is redeemed within 365 days of the investment. This is the best plan for long-term growth for the parents whose child age is under 10 years. Mirae Asset Emerging Bluechip Fund is a Small and Mid-Cap category fund and the Crisil has it on position 2. It has provided a return at the rate of 40.2% in one year and in the last five years, it is 31.0%. The fund will attract an exit load of 1 percent if the fund is redeemed within 365 days of the investment. Aditya Birla Sun Life Frontline Equity Fund is a Large Cap category fund and the Crisil has it on position 2. It has provided a return at the rate of 27.4% in one year and in the last five years, it is 18.5%. How much tax do you pay on shares? Canara Robeco Emerging Equities is a Small and Mid-Cap category fund and the Crisil has it on position 2. It has provided a return at the rate of 42.9% in one year and in the last five years, it is 29.0%. Currently, it is managing AUM of Rs 1,966.60 Crores. Share Market Introduction What is Nifty 50? If your child is a newly born then to accomplish his 10 years’ need of education, you should invest in equity funds. Equity funds are long-term oriented funds which give you higher returns in the long-term. You can choose to invest in a balanced fund also. Always prefer to make investments via SIP route. In this way, you will be able to invest that amount of money which is under your affording power. If your child is enjoying school days and going to pursue college in next 5/more years, then you should do investments in equity and balanced funds and this will be really an ideal choice for your child’s bright future. If the above case is reversed, i.e. your child is going to pursue in college in less than 5 years then you should not take a risk with equity investments. Rather, you should invest in Debt oriented securities and balanced funds. You should convert your equity investments into debt one, two years before your child accomplish his college studies. Try to increase the amount of investment which you do via SIP. This will help you to accumulate more wealth over time. Check the performance of SIP time to time. If your SIP is not performing well in 3 years, then it would be better to switch your plan. You should continue to invest the money in equity when your child is at an early age, like between 0-12 years. This is because equity provides you higher returns but after a long time. So, when you have enough time-horizon then only you should invest in equity. After that, you should switch towards balanced and other debt-oriented funds. Do you actually need a child plan? Why not? In fact, this becomes necessary if you have a child. A child gives his parents a drive and urges to do something happening with the finance available to them. It is just because of their child, that every parent makes efforts to direct the career of the child at better places and for this, they choose child mutual plans. This fund is particularly based on child fund and it motivates the parents to maintain the discipline regarding the fund like the timely investment of money, following the maturity rules, taking care of money and all stuff like. It becomes a little for-granted issue when it comes to the parents themselves. The investments made by the individuals for themselves do not create that discipline in them which they otherwise feel possessive for their child. The phrase truly holds a deep and universal truth meaning for every living body on this earth. Even, it applies to mutual funds also. A parent who starts to save the money at the earliest is able to save a lot of and enough money for his children. Proper planning at right time and at the right destination builds powerful money in the pockets of an individual thereby removing the future headaches of investing here and there or anywhere and expecting the good returns. If you do not want to take any headaches about fulfilling the cost of education for your child, then you should invest early when this thing comes to your mind. If you have not invested yet, then do it now. You should not invest in equity during your child is pursuing the college studies. It is because your investment in equity does not guarantee the superior returns and it is a long-term investment also. You’d surely want your money early to fulfill your child fees on time but equity cannot help you out for this until and unless you had invested in it before 5 years ago. In such a case you should invest in the debt fund and balanced fund. It assures you to provide regular returns at-least at a fixed rate of return. So you know better than how much you will get at what timings. It is better to choose the SIP route for your all-purpose investments. In this way, you will be able to diversify your portfolio with a small amount of investment regularly in every fund. This will generate a better income from all sides for you. So, investors, this is all about best mutual funds schemes for child education. Go for it, secure the future of your children! “Always, always have a plan” your child future will be created by what you do for them today! My sincere advice is to invest in the best child plan mutual fund 2019 to fix your child’s future! This is all about your Child’s mutual fund. If you love reading the above-detailed study on a best mutual fund for child education, do write to us. I am much delighted to share my knowledge pertaining to the best mutual fund for child education. I hope you got an answer to your query which is the best mutual fund for child education. Also, if you like it please share it with others. If you have more queries then let us know. We will surely help you in making your decisions. Just like and subscribe us to get regular updates from this site. Comment on the comment box to know your problems, suggestions or doubts. Thanks for reading us & have a great day!